The shutdown is affecting countless sectors of the federal government—national security officials warn of the risks to American lives, NASA scientists are concerned the ordeal may dissuade talented applicants to federal jobs in the future, a top White House economic advisor warned on CNN that the shutdown may lead to zero economic growththis quarter, and federal workers continue to call in sick across the country with little other recourse. But the Trump administration is gearing up for the possibility of the shutdown dragging on for weeks longer. The Washington Post profiles Jared Kushner, the president's son-and-law turned top aide, as he takes on a central role in the shutdown negotiations. The State Department is not recognizing Venezuelan President Nicolás Maduro's decision to expel U.S. diplomats from the country after President Trump and other major world leaders backed Venezuelan opposition leader Juan Guaidó as interim president. Senate Majority Leader Mitch McConnell once called himself the guy who gets Washington out of shutdowns. But he's so far taken a back seat to President Trump as the partial government shutdown continues. 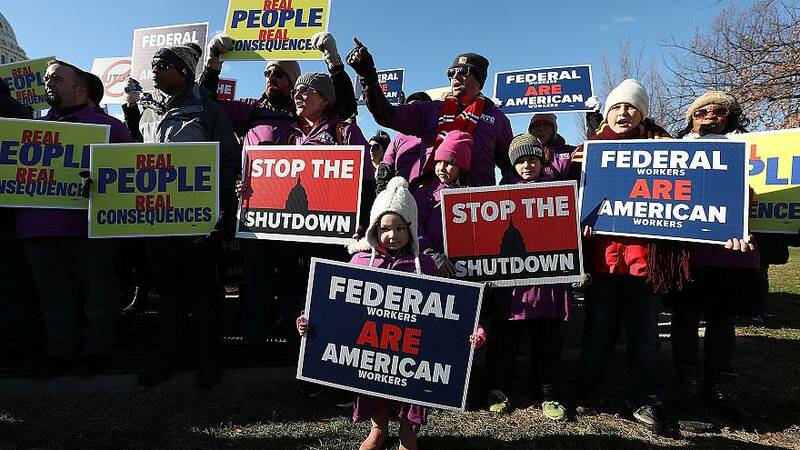 Thursday's Senate votes on reopening the government are expected to fail, but The Washington Post reports lawmakers hope the votes are the first step toward a compromise. Lawyers for Paul Manafort, President Trump's former campaign chairman, say Manafort hasn't been lyingto the special counsel's office as it claims. House Democrats are nearing a proposal to "meet or exceed" President Trump's $5.7 billion target for border security while blocking those funds from being used to build a physical wall. With House Speaker Nancy Pelosi refusing to authorize the joint session of Congress for President Trump's State of the Union, the president announced he won't deliver the speech until the government reopens. Freshman New York Democrat Alexandria Ocasio-Cortez was the only Democrat to break with her party's billto re-open the federal government because the funding bill included money for Immigration and Customs Enforcement. After former Trump lawyer Michael Cohen delayed his testimony to the House Oversight Committee, top House Democrats are promising that Cohen will eventually testify. Meanwhile, the Oversight Committee told the White House it will investigate how Jared Kushner obtained his security clearance after a lengthy delay. Texas Democratic Rep. Sheila Jackson Lee is stepping down from her post as the head of the Congressional Black Caucus Foundation after a lawsuit claims she retaliated against a former foundation intern who claimed she had been raped by her intern coordinator. 2020: How the Dem primary season could turn into "Lord of the Flies"
NBC News' Jonathan Allen writes that the increasingly-crowded field of Democratic presidential candidates could throw the party to a contested convention, the very cycle after a debate about the role of superdelegates inflamed tensions within the party. The New York Times details how Vice President Joe Biden's 2018 speech in southwestern Michigan, for which he was paid $200,000, helped boost Michigan Republican Rep. Fred Upton during a pivotal stretch of his tough reelection fight, frustrating some Democrats along the way. Former New York City Mayor Michael Bloomberg decried the push to legalize marijuana "perhaps the stupidest thing anybody has ever done." Political Wire's Taegan Goddard is launching a new interactive site to track the 2020 electoral map.